Contact form 7 Leads Tracking is an addon module for the Contact Form 7 plugin. It helps you track the user who filled out the form. All you need to do is add a [tracking-info] shortcode to any outgoing email in contact form 7. The URL on which the user filled out the form. The URL from which the user came to your site. The first page the user visited on your site. 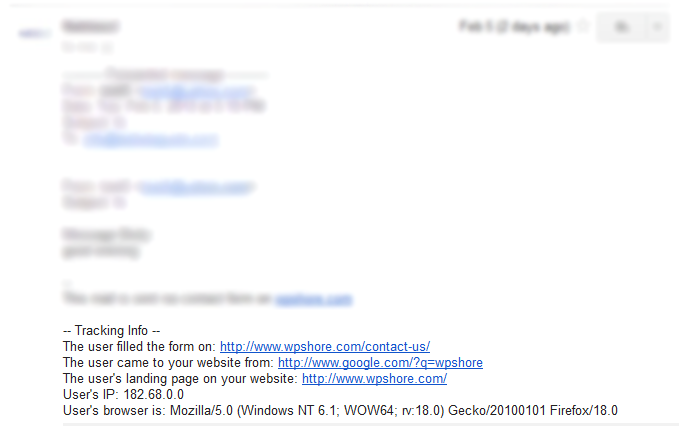 The IP address of the user who filled out the form. The browser information of the user who filled the form. Upload the Contact Form 7 Leads Tracking folder to the /wp-content/plugins/ directory. thanks for this..plugin..! !Keep it up..!! Just what I needed for my website. While testing the plugin, you might get same pages for all URLs as you would be coming to the page by clicking on the home page of your website. But once you check the data for the real visitors, you’ll exactly see the data you need. Let us know if we could be of any further help. Fantastic plugin! Just add the short code to the message body in Contact 7. That’s it! This plugin is useful for us to aid in helping our customers who are experiencing issues with installation of our software. Many thanks to the Developer. It’s really usefull plugin. And it’s musch more simple than I expected – just add ONE shortcode in CF7 settings and it already starts to work. Great plugin. For complete statistics lacks a key request from the search engine. I’ve tested your tool and I can only get tracking information if the visitor lands and fills out a form on a single page and does not navigate beyond that. If the visitor visits any other page of the site and fills out a form, the Original Referer (a Google URL for example) is lost and it shows the landing page on my site as the referrer. Any suggestions? Great plugin, and really useful. But I was wandering if the client only needs the URL to be tracked and don’t want other information, how can that be removed? Tests and non-tests alike do not seem to be showing accurate tracking data… the form on, referring url, and the page they landed on are all the same; the page before the form. What can I do? Running wordpress 4.5.2 (the current-most up-to-date wp). i want to assign a tracking number to the user form submission for future process how should i do that.